On 25 February 2016 Peter Dearlove ringed 16 birds at the Dundee Sewage Works, including two Southern Red Bishop retraps. One of these was an adult female (ring FA05661). I had ringed this bishop a few kms away, at the Dundee Quarry, as a recently fledged juvenile, in 2000. The elapsed time was 15 years 2 months 10 days. 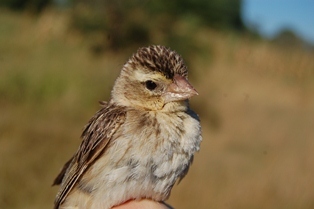 Only two other weaver species have longevity records of over 15 years in the wild, Sociable Weaver and Southern Masked Weaver. See these weaver longevity records here.